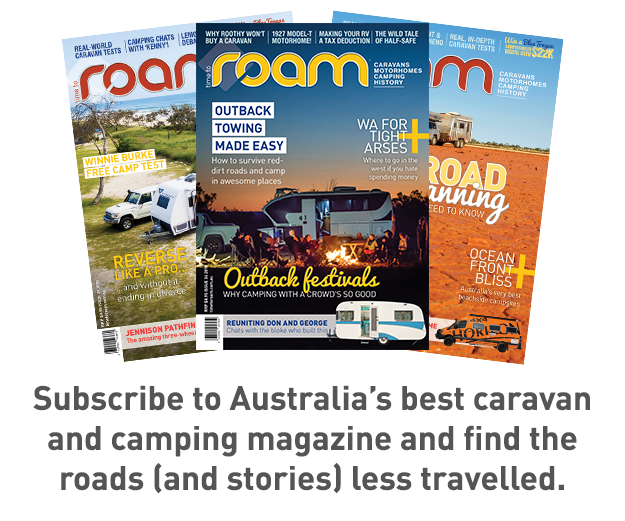 The soaring land formation known as the Nimbin Rocks provides a stunning backdrop for Lorraine and Andy Keen’s “treechange” home – and their pride of five retro Kombis and two caravans. The collection began when Lorraine was about to celebrate her 50th birthday and Andy had a bit of making up to do. Although they’d been together nearly 30 years, he admits he’d rarely bought her a Birthday present. So for the half century milestone, he told her she could have whatever she wanted. It was an easy choice. Lorraine wanted to wind back the clock and re-live some glory days of her youth. Not long out of her teens, Lorraine married a surfer and headed off on a round-Australia surfing safari in a Kombi. They got as far as Ceduna and the Kombi died. Like Kombis tend to do. Lorraine always longed to own a Kombi again. 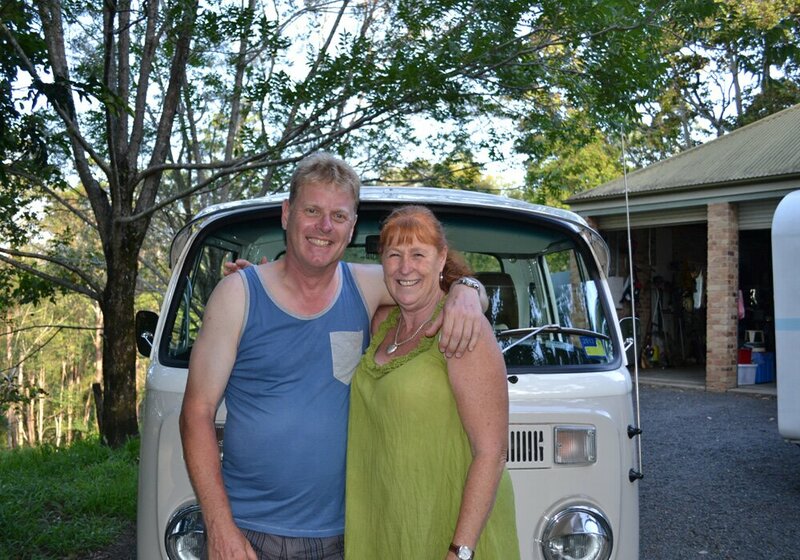 “When Andy asked me what I wanted and I said, “I want my Kombi back!” Andy had never owned a Kombi and had no idea what he was getting himself in to.” A wattle-coloured 1974 Kombi camper christened Maggie was bought for the birthday. She was later traded for a totally original 1976 Sopru Campmobile model, almost the same as the one she owned at 21. “Molly” was trucked to Nimbin from the far reaches of WA. Alongside Molly sits Blue Bus, a 1967 wood-lined panel van, originally used as a bakers delivery vehicle in outback Queensland Monty is the pride of the fleet. The Keens refer to the 1977 builders van as their “show pony” because it draws crowds and admiration from judges as they travel around to shows. An immaculate restoration was carried out over many months, as with all their projects, with the help of professional tradespeople in the Lismore area.Today the VW flatbed ute is estimated to be worth in excess of $25,000. “They’re very hard to find these days because they were usually just worked to death,” Andy said. Outside the garage and down towards the end of the yard are two more VW vans – Ugly Betty and her mate Happy were rescued from rusty graveyards and are now continuing their decline in full view of the Keen’s home. They have no intention of doing much with them. “They’d cost too much to restore. I just enjoy sitting on the veranda and looking at them,” Lorraine says. Then there are the caravans, purchased with the aim of providing more comfortable sleeping quarters when they go to Kombi shows. Mildred, now Monty’s show partner, is a Culbert Cruiser 10 bondwood kit van, built by the father of their next door neighbour in the early 1970s from a late 1960s plan. Possibly one of the last kit vans of its type assembled. Andy says the Kombis have been the best value investment he’s ever made and predicts classic caravans are heading the same way. “Nothing else I’ve owned has increased in value as much as the Kombis. And since we’ve had Mildred accompanying Monty to shows and camp grounds, it seems as many people want to check out the caravan as much as the Kombis.” The Keens obviously love their Kombi collection and showing them off to admirers. They regularly travel to shows, taking care to make plenty of stops along the way to avoid overheating. A highlight of their calendar is helping to organise the annual Nimbin Kombi Convoy – a festival re-enacting the arrival of hippies to the former dairying town in the 1970s. While they admit to being Kombi lovers from Nimbin, they say it does sometimes see them stereotyped.